In an America’s Cup trial race, owner and skipper George Nichols jibes Weetamoe around a mark as Mike Vanderbilt and Enterprise follow close astern. Though very evenly matched, Enterprise would ultimately prove the faster boat and go on to defend the Cup in 1930. 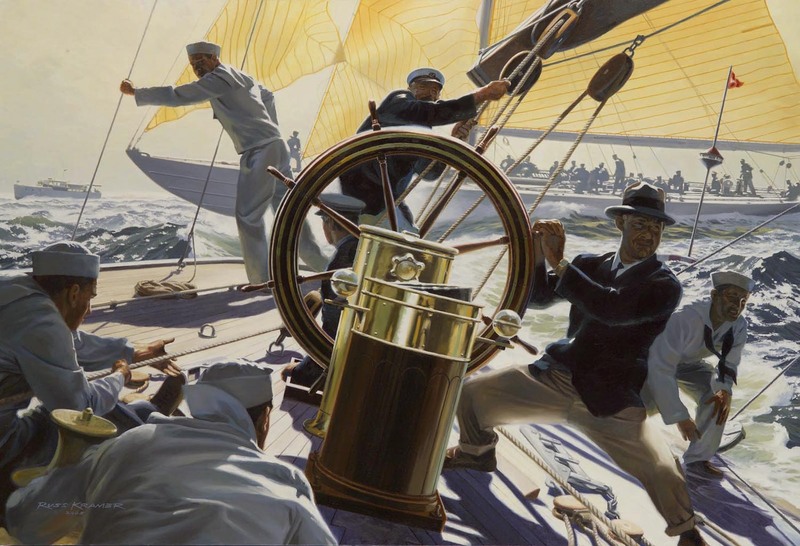 Russ Kramer writes: Inspiration for this painting came from some grainy, vintage black & white film shot aboard the great Herreshoff J Boat. What a thrill to watch the crew work and feel like you were among them! And so I imagined a much more dramatic scene than was pictured in the film, creating a composition with new crew figures, a close-in Enterprise and much additional detail researched at the Herreshoff Museum in Bristol, RI. Launched May 10, 1930. Name: “Weetamoe” was an American Indian Queen; Tobin bronze plating. Triple-headed rig. Morgan Syndicate: George Nichols, J.P. Morgan, Cornelius Vanderbilt, Arthur Curtiss James, George T. Bowdoin, Henry Walters, Gerard Lambert. Cost estimated at $300,000 for hulls, rig, and sails. Narrowest of the four 1930 US boats. Sold to Fredrick Henry Prince, October, 1930. Hull modified for 1934, including larger and heavier keel; believed to be slower, later restored to original configuration. Weetamoe also raced in the off-years between defenses. This original oil painting on canvas, 44” x 30”, was sold into private collection during the 2005 Modern Marine Masters exhibition at the gallery at Mystic Seaport, May 2005.